The surprise announcement at the Daimler Buses pre-Kortrijk event in September was a new, lightly hybridised version of the Citaro bus. Statically displayed there, and at Busworld, the first chance to experience it on the road came recently at a ride-and-drive opportunity in Mannheim, where two examples were made available. 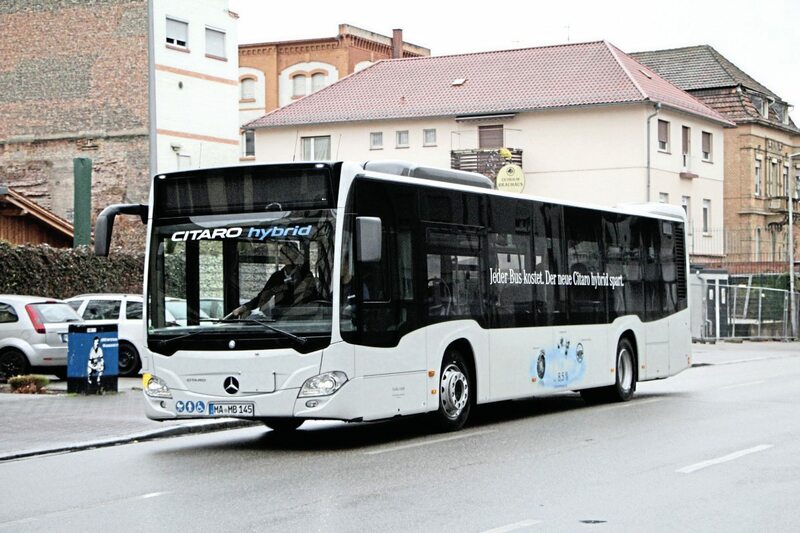 From 2009, Mercedes-Benz had briefly offered a hybrid version of the previous generation of Citaro that incorporated four electric wheel-hub motors. Available only as an articulated unit, this had the ability to travel in zero-emission, pure-electric mode and only around 150 were sold. 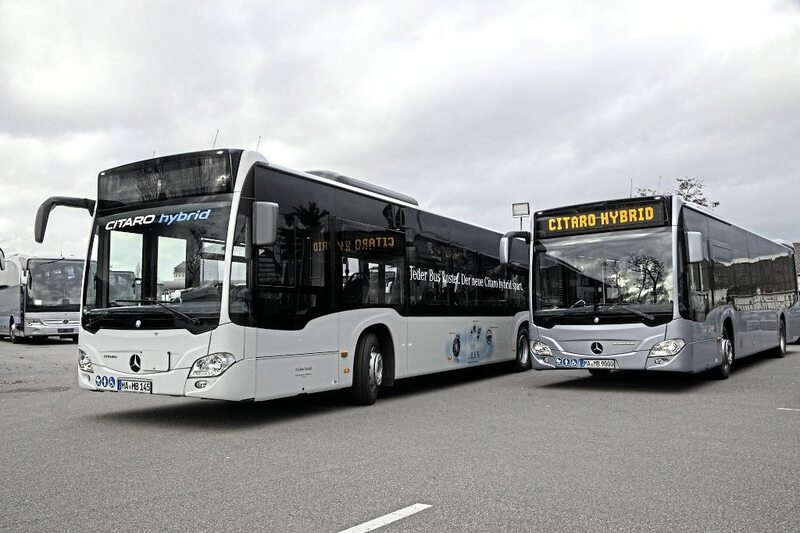 The latest Citaro to carry the Hybrid name is very different in concept, has no zero-emission capability and is available on the majority of Citaro models. It is less a step towards electromobility than a logical extension of the efficiency of the trusted diesel solution in which Daimler still strongly believes, though it will be unveiling a full electric Citaro during 2018. There are three elements provided as standard in the new Citaro Hybrid package, two of which are (or will be) also available as options on conventional diesel and CNG-fuelled versions. Along with the hybrid system, purchasers will also get the ZF AV133EP drive axle, described by Daimler as a ‘lightweight running axle,’ and the intelligent eco-steering system. The AV133EP portal axle looks the same as the existing AV133 but has lapped and polished gears which are smoother and reduce noise by four decibels. It has a membrane breather rather than a ventilation pipe and also uses partially synthetic oil rather than mineral oil which reduces foaming and helps enable service intervals to be increased from 180,000km to 240,000km. The electro-hydraulic intelligent eco-steering system is ‘requirements-optimised’ to use Daimler’s terminology, which means that assistance is only provided when you turn the steering wheel with no power requirement otherwise. Produced by ZF, it contributes a fuel saving of up to 3.5% in city operation, has a very small lubricant requirement and means the 24m of piping between the front and rear of the bus is no longer required. 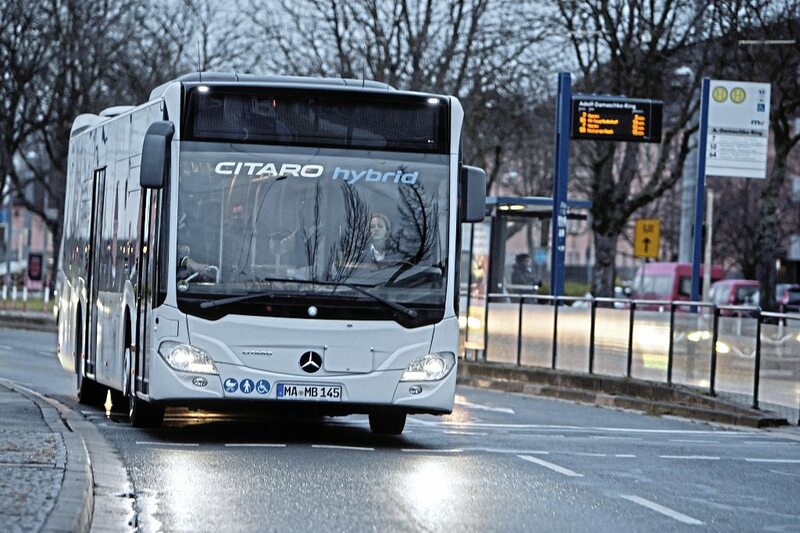 At the heart of the Citaro Hybrid is a system with three key components. 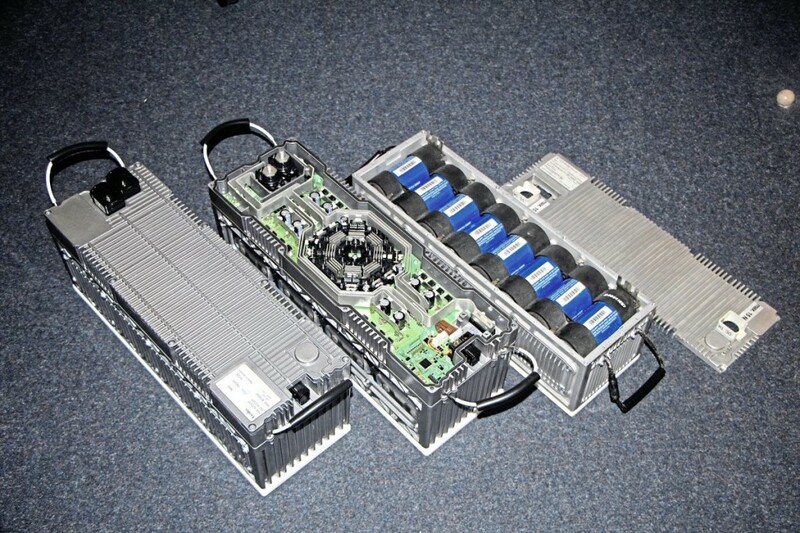 These are: a 14kW Melco (Mitsubishi) water-cooled electric motor, mounted between the diesel unit and the gearbox, capable of producing peak torque of 220Nm; a small additional radiator, sourced from the Actros truck, mounted alongside the existing radiator; and two mild hybrid storage units incorporating double-layer super-capacitors and condensers. These have a total capacity of 2Ah and a water cooled inverter that converts the direct current stored within it to alternating current to drive the electric motor. In operation, when the bus slows down, which in practice means as soon as the driver takes his foot off the accelerator, the electric motor becomes a generator recovering the braking energy and converting it into electricity. This electricity helps the diesel (or CNG) unit, reducing the amount of diesel power it requires, especially when accelerating away from a standstill but also when idling, helping to increase the efficiency of the diesel unit. Filling the super-capacitors is a very rapid process, taking less around 20 seconds, after which they will assist the diesel unit for around 30 seconds. Switching between charging and discharging is close to instantaneous. Rather than a high-voltage system, the electrics are 48 Volt so there’s no bright orange cabling, no special tools and no need to specially train mechanics. The super-capacitor is proven; it is the same alternator-charged unit that has been used on the Citaro to supply the 24-Volt systems since Euro VI was launched. 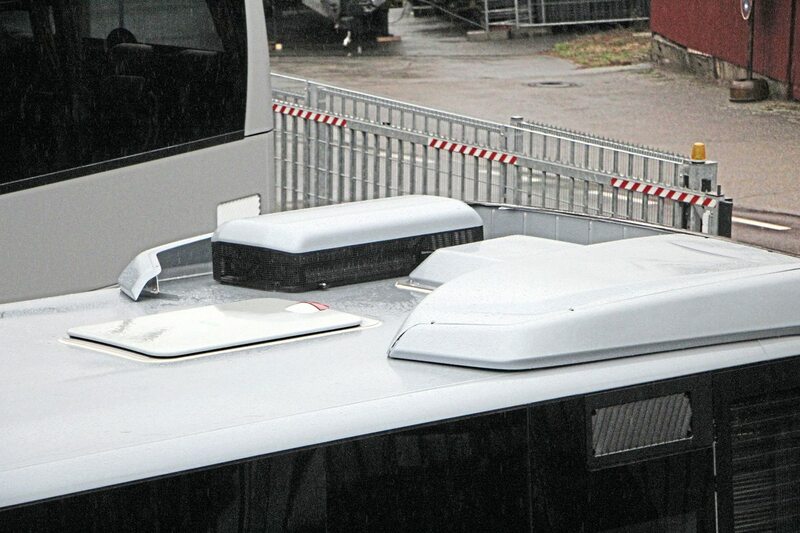 The two additional capacitors are roof-mounted at the rear, charged by the generator function of the electric motor and have different software to enable them to operate at 48 Volts. I was told that tests on five-year-old super-capacitor units show that they still offer 95% capacity at this stage. Similarly, the electric motor is taken from an S-Class car, though in that it provides sufficient power for stretches of emission free driving. 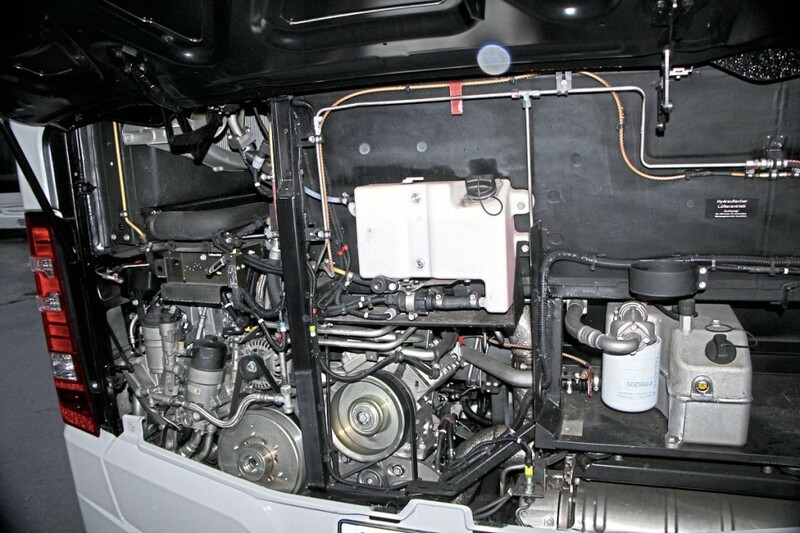 Two alternators are fitted as standard, with a third if air conditioning is installed. Together the three package elements are said to give a TCO (total cost of ownership) improvement of up to 2.5%, through an 8.5% improvement in fuel consumption and reduced maintenance costs. In emissions terms, compared with a Euro V EEV Citaro, the Citaro Hybrid produces 18% less CO2, 83% less NOx and 98% less particulate matter (PM). Overall, the package including the motor, additional radiator and two super capacitor units adds 156kg to the overall weight of the bus. The theoretical implications of this vary depending on model but can be up to three fewer standees on certain city buses, although with the relocation of equipment one additional person is possible on inter urban specifications. At the current time there are no plans to offer a similar package in any other Mercedes-Benz products which is perhaps surprising as several others have similar driveline components and there does seem to be interest in models such as Irizar’s i4 Hybrid. Helpfully, all Citaro frames built from now on will have frames modified to enable the retrofitting of hybrid equipment at a later stage if it is not installed initially. The two 12.135-metre, dual-entrance vehicles provided for our tests were to similar specifications featuring the 295hp/220kW version of the 7.7-litre OM936 engine (a 349hp/260kW is available) and the ZF EcoLife 6AP1200 fully automatic transmission (the Voith DIWA is an option). Both buses had the existing ZF AV133 rear axle rather than the new AV133EP unit that will be fitted from May onwards. There was no fuel consumption monitoring equipment fitted so comparison of this nature was not possible, although I expect Daimler will arrange something to demonstrate this at some future stage. Travelling on the very lightly laden bus as a passenger for over 70km I could discern absolutely no difference between it and a standard diesel in terms of noise, performance or handling characteristics. As mentioned at the launch, the only difference visible inside is a new larger hatch beneath the seat ahead of the engine compartment. Speaking to several colleagues about their driving experience of it, they shared my perception in respect of the hybrid system, though Cristiana Sandulescu of the Romanian magazine Tranzit told me that she found the intelligent eco steering slightly stiffer when turning, requiring slightly more manual adjustment. Italian, Danilo Senna of Tuttotrasporti thought that it might retain gears marginally longer when accelerating. Otherwise it was indistinguishable from a diesel. Like me, Cristiana was puzzled by the absence of any indication on the dash of the level of charge in the super-capacitors or of when energy is being recuperated, indeed there is no sign to the driver that the bus is not a standard diesel. Many UK drivers have been trained to get the most out of hybrids and had imagined more information would enable them to maximise fuel savings. Putting this to one of the Daimler team, I was told that the lack of a dash display was deliberate because there was no need for the driver to develop a strategy because charging and discharging took place so rapidly that it would be difficult to influence it. Drivers needing no additional training was seen as an advantage of the system. UK operators will be able to specify the new Citaro Hybrid in right-hand drive format, but only the two axle 10.6m and 12.0m models. The reason there will not be an articulated alternative is that it is not currently possible to offer buses equipped with the larger OM470 engine, rather than the OM936, with the equipment, apparently because there is around three centimetres too little space to fit it in. I am told that the possibility of re-engineering the gearbox mountings to permit it is being explored for the longer term. The first demonstrator will arrive here in September, although whether it will be a 10.6m or a 12.0m model has yet to be decided. In cost terms it will be in the region of £9,700 (€11,000) more than an equivalent diesel. We were told that the two buses demonstrated had retail prices of €260,000 (£229,408) and €270,000 (£238,231) for the more highly specified example. Though the UK Sales Director, Marcus Watts, recognises that the UK differs from most European markets where 18-tonne GVW city buses are the norm, he told me that he sees UK potential for applications such as park-and-ride, car parks, airport duties and other uses where there is a lot of idling involved. “It is where people still want 18-tonne products and this is an 18-tonne bus with a low carbon impact,” he said. He could not say yet whether it would qualify as a low carbon bus within the UK regulations. Since there was no difference for the driver or passenger, nor to a considerable degree to the maintenance staff with no orange wires to avoid, was my trip a waste of time, you might ask? I think not, rather it was the point of the exercise. While hybrid buses save fuel, the extra purchase cost, additional complication, increased maintenance costs, questionable residual values and often reduced reliability associated with them mean that they are not an obvious purchase when their use is not dictated by a tendering authority. 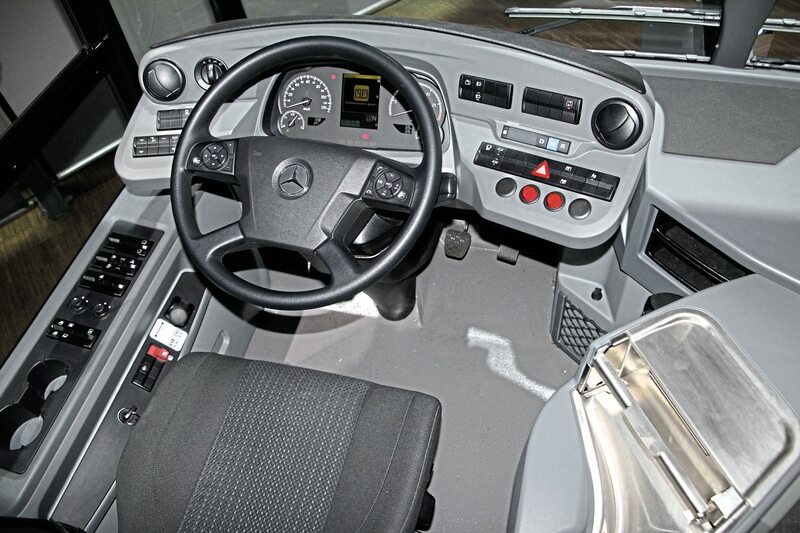 In introducing a hybrid that delivers a clear amortisation capability coupled with few if any of the recognised hybrid downsides and the ability to continue functioning should the additional features fail, Mercedes-Benz is offering a bus that should suit operators and legislators alike, providing the 18-tonne concept is what they seek.